The conversion method involves melting the carbon using nanosecond laser pulses and then quenching, or rapidly cooling, the material. These diamond fibers could find uses in nanoscale devices with functions ranging from quantum computing, sensing and communication to diamond brushes and field-emission displays. 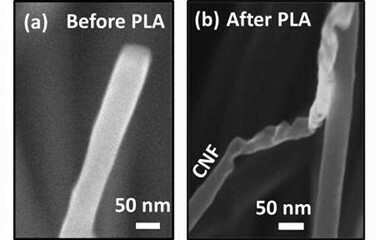 The method can also be used to create diamond-seeded carbon fibers that can be used to grow larger diamond structures using hot-filament chemical vapor deposition and plasma-enhanced chemical vapor deposition techniques. These larger diamond structures could find uses as tool coatings for oil and gas exploration as well as deep-sea drilling, and for diamond jewelry. Previous methods used to convert non-diamond carbon to diamond have involved using extreme heat and pressure at great expense with a limited yield. Melting the carbon with laser pulses and then undercooling it with a substrate made of sapphire, glass or a plastic polymer are the two keys to the discovery, said Dr. Jagdish Narayan, John C. Fan Distinguished Chair Professor in the Department of Materials Science and Engineering at NC State and corresponding author of a paper describing the work. “Without undercooling, you cannot convert carbon into diamond this way,” Narayan said. When heated, carbon normally goes from a solid state to a gas. Using a substrate restricts heat flow from the laser pulse enough that the carbon does not change phases. The laser, similar to those used for Lasik eye surgery, is used for only 100 nanoseconds and heats the carbon to a temperature of 4,000 Kelvin, about 3,727 degrees Celsius. NC State has filed for a patent licensing the technology. The paper, “Direct conversion of carbon nanofibers and nanotubes into diamond nanofibers and subsequent growth of large-size diamonds,” is published in Nanoscale, a journal of the Royal Society of Chemistry. The paper was coauthored by Anagh Bhaumik, a research assistant in the Narayan lab; Dr. Ritesh Sachan, an assistant professor at Oklahoma State University and former researcher in the Narayan lab; Ariful Haque and Siddarth Gupta, graduate students in the lab; and Dr. Punam Pant, a research scientist in the Narayan lab. The research was done with support from the National Science Foundation, under grant number DMR 1735695.